Anyone caught out be the current mini heat wave we are having in the UK might like the look of these lovely easy to wear silk shirts by designer Lisa Taylor. 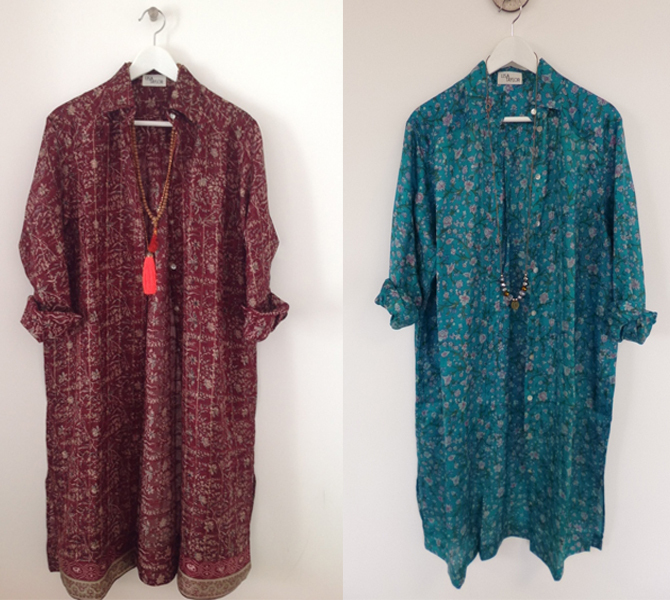 Lisa is a friend of Jane’s and wondered if our readers might like to see her range of ethically sourced clothes and accessories. We LOVE them and at £55 they seem a perfect wear-now buy. I should point out the shirts are only made in short runs and sell out fast and I’m slightly ahead of you in the queue…. 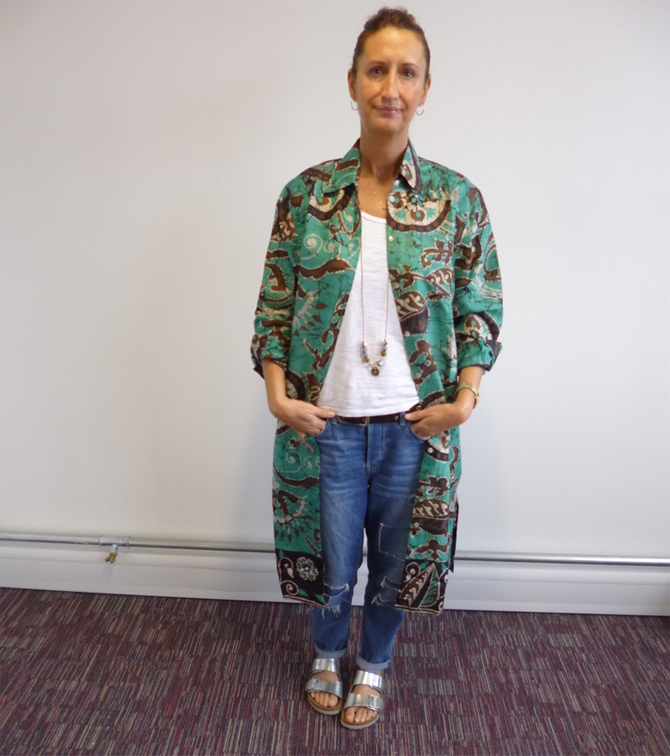 I trained as a designer worked in fashion for 25 years, as buying director at Warehouse, design director at Oasis as well as consultancy roles for other high street brands. I also launched Ltd Collection at M&S with Yasmin Yusuf. So tons of experience especially on the sourcing and product development side! My passion has always been travel and researching things, so on my trips to India I connected with many small communities and crafts people, who were happy to work with me and do small production runs. My whole ethos is to be as ethical as possible and give total transparency on how things are made. I keep things very simple and just focus on key items, so scarves, kaftans, jackets and kimonos are what I mostly sell and currently I just do one size only. I don’t chase trends but I have an awareness of what’s happening and hopefully that comes across in the product. As most of my pieces are recycled fabrics, that makes each piece totally unique and therefore no two pieces are the same. I have a broad range of customers but I like to think that my pieces are timeless and just beautiful, versatile pieces that stay in your wardrobe forever. If I’m honest my demographic is the older, fashion aware woman who wants something unique and beautiful and who wants to shop consciously and is a bit bored of the high street! Tells us about the shirts, they are gorgeous! These shirts are made in a tiny unit in Delhi where I have a close relationship with the owner and all the team that produces them. We don’t make huge amounts, we bought 50 of these shirts but I always have the flexibility to get back into them, as long as I find the right fabrics. I personally source all the vintage silk saris, they come from all over India. It can take days to just sit In a room and go through lots of them, so I hand pick the most beautiful prints with the best colours that suit the English complexion. I work with the pattern maker and we make the samples and I do all the fits. The main thing is they need to be versatile, they need to be worn and loved and not brought out for special occasions! I wear mine with jeans and a t- shirt but I also wear it over my bikini on the beach, so they are perfect for holidays and for anyone that travels, as they pack away to nothing. The deal with all my products is that they will be just beautiful easy, classic shapes that will be in your wardrobe forever. Couldn’t resist, I just pressed buy… I can only hope that I will look as glamorous as Lisa in mine when it arrives and I love Lisa’s description of her demographic – that’s me! Thank you for introducing me to this lovely ethical brand. 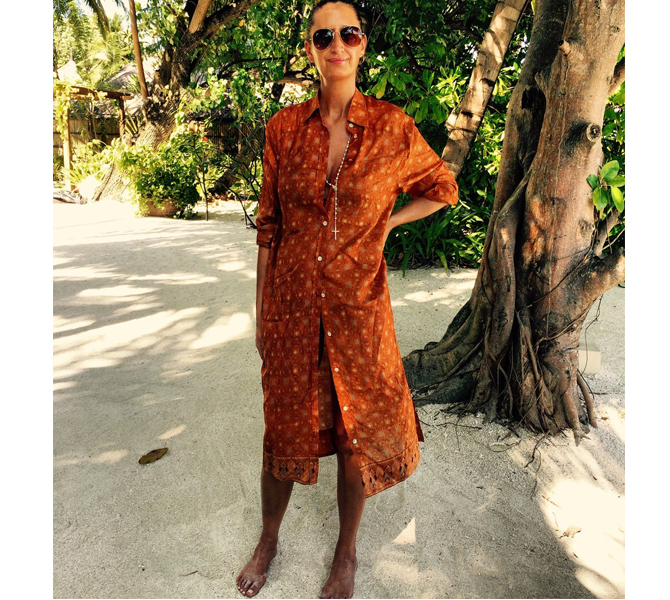 I love the way Lisa wears the bronze one as a cover up, I have bookmarked the site – great gifts. Love the long line shirts and want one. Read this post too late obviously and the only colours left won’t suit me so please tell Lisa to get more!